Parents are funny — especially on Facebook. And we love them for it. So let’s give a shout-out to the hilarious moms and dads who aren’t afraid to tell it like it really is. 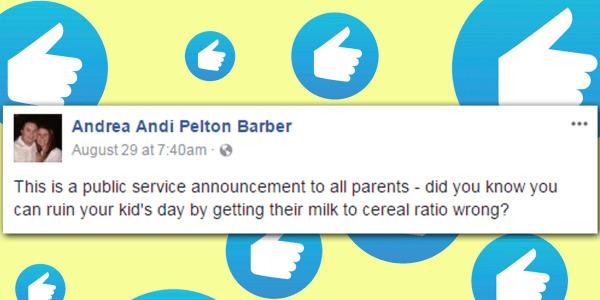 Here are our picks for this week’s Funniest Parents on Facebook. Because sometimes your back-to-school photo looks just like the palm of your kid's hand hitting your phone. Want to share your funniest parenting moments with TODAY? Just post them on our Facebook page at TODAY Parents, or tag us OR Sarah Maizes (our Parenting-Humorist-at-Large) in your comments. We’ll pick our favorites to feature in our next installment. Want more funniest parents on Facebook? Find them here! Sarah Maizes is a writer, comedian, and award-winning author who’s written several picture books for children, including "On My Way to The Bath" and "On My Way to Bed." Follow her on Facebook, Twitter and Instagram.